Coil springs are important mechanical parts that help to absorb shock, maintain tension, or transfer kinetic energy to different parts of a machine. This type of spring can be found in dozens of different tools and appliances, ranging from mattresses to computer keyboards. Generally speaking, a coil spring comes in one of three types. A tension or extension spring is designed to keep a component from stretching too far. These can often be found in beds and box springs, ensuring the mattress stays comfortably in place. Compression springs absorb energy and make sure that mechanical components don’t get damaged. This type of coil spring can be found in computer components, while larger ones help maintain a car’s suspension system. Finally, torsion springs help limit how far a person can twist a part. This type of coil spring helps garage doors work properly. Because coil springs come in numerous different types and require strong manufacturing quality in order to work effectively for a long period of time, it is important to have an excellent manufacturer behind their design. 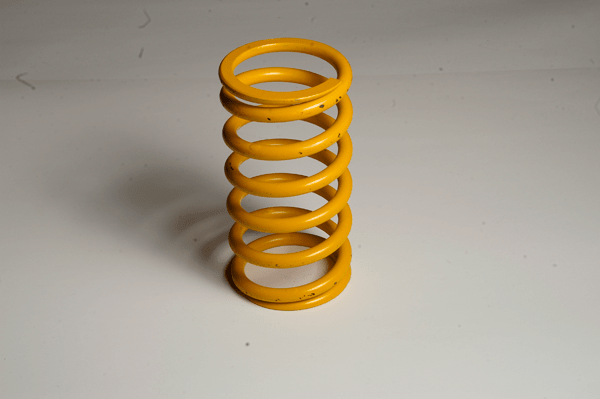 Custom Spring Corporation has experience with the many different sizes and types of coil springs and can ensure that your springs are durable enough to last through rigorous use over long periods of time. If you are having difficulty finding coil springs in the size and general design that you need, take a look at the inventory we offer. Thanks to the wide range of sizes, materials, and features we offer with all for all of our standard springs, you may find exactly what you want. Our catalog includes an extensive line of coil springs that are used in both automotive applications and related machines. If you need help in deciding what spring is right for you, our team can help match the part to the job at hand, making sure that you get the longest-lasting spring for your mechanical or automotive needs. We are happy to help you make sure that you get the coil spring you need for the job at hand. If you have any questions, simply contact one of our knowledgeable sales representatives for an immediate solution. After you try us for custom springs design project, you will never have to worry about where to find the perfect coil springs again.